In the film's prologue, a young British tourist girl named Cathy Bowman (Camilla Belle) from a yacht cruise was attacked (but not injured) on Isla Sorna, 87 miles SW of Isla Nublar, by a swarming pack of small, carnivorous bipedal Compsognathus (also known as Compys), further damaging InGen Corporation's reputation and finances. John Hammond (Richard Attenborough) lost control of his company to his renegade, exploitative businessman/nephew Peter Ludlow (Arliss Howard). Hammond explained to analytical mathematician Ian Malcolm (Jeff Goldblum) how he wanted him to travel to Site B, the auxiliary island for breeding living dinosaurs (genetically-engineered and previously extinct) before they were moved into Jurassic Park, along with a team composed of: documentary film-maker and ecologist activist Nick van Owen (Vince Vaughn), field equipment gadgets expert Eddie Carr (Richard Schiff), and his own tough-minded paleontologist girlfriend Dr. Sarah Harding (Julianne Moore) who was already on the island. Hammond called the mission "our last chance at redemption" and explained how the island was "without fences, without boundaries, without constraining technology...safe from human interference," after Hurricane Clarissa had devastated the island. The main purpose of the trip was to observe and document the reptiles - "the most spectacular living fossil record the world's ever seen." When they first arrived and found Sarah, she was studying a Stegosaurus herd; Malcolm was unexpectedly joined by his stowaway adopted adolescent daughter, Kelly (Vanessa Lee Chester). They were surprised by the arrival of InGen employees, including group leader and big-game trophy hunter Roland Tembo (Pete Postlethwaite) and his sadistic assistant Dieter Stark (Peter Stormare) who were attempting to cruelly capture many species of dinosaurs for exploitative display in a prehistoric zoo in San Diego. They used a wailing baby T-Rex (with a broken leg) as bait to lure adult T-Rexs. Nick freed many of InGen's imprisoned animals and attempted to treat the injured bleating baby Rex with Sarah in their trailer, but the "very angry" adult parents terrorized them. In the film's most exciting sequence, one-half of their hinged trailer hung off a cliffside during a torrential rainstorm, and Eddie lost his life (when torn in half) to two enraged T-Rex parents when attempting to rescue Malcolm, Nick and Sarah who were dangling from ropes. Both teams decided to trek across the island to an old communications center to radio for help after all the equipment was damaged or lost. When separated from the group, Dieter was eaten during a Compsognathus swarm. 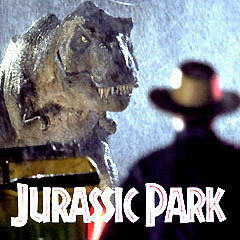 The T-Rex attacked the camp and Sarah's tent after following the baby infant's scent on her jacket, and long-haired paleontologist Dr. Robert Burke (Thomas F. Duffy) ran into the jaws of a pursuing Tyrannosaurus behind a waterfall when trying to avoid a poisonous coral snake that had crawled down his shirt. Malcolm reminded the manipulative Ludlow: "Taking dinosaurs off this island is the worst idea in the long, sad history of bad ideas." Voracious raptors attacked after Nick radioed for helicopter rescue (and gymnastics-trained Kelly helped save her father), while Ludlow schemed to take one T-Rex (and its infant flown by plane) on the SS Venture to San Diego, telling Roland: "You've got your trophy!" Dockside in the early morning hours, the manipulative Ludlow announced the opening of Jurassic Park San Diego - a "mega-attraction that will drive the turnstile numbers to rival any theme park in the world" - as the Venture plowed into the dock (with a dead crew) and the T-Rex escaped and went on a killing rampage in the film's best action sequence. The giant dinosaur romped through neighborhoods of suburban homes ("There's a dinosaur in our backyard"), drank from a swimming pool, ran down main streets and pursued a city bus. Driving a red convertible, Malcolm and Sarah eventually lured the angry dinosaur back to the waterfront to join up with its baby, where the T-Rex adult injured Ludlow and then the baby finished him off inside the cargo hold. The tranquilized beast was transported back to the island (escorted by the US Navy), as a CNN Live TV broadcast revealed that Hammond had been reinstated as InGen's Chairman. This film was a continuation of the first film, set four years later. With many of the same characters from the original film. With a production budget of $73 million, and box-office gross receipts of $229 million (domestic) and $619 million (worldwide). More violent than the first film. Set-pieces: the dangling trailer over a cliff scene (with slowly breaking window glass), and the San Diego suburban and waterfront rampage of a T-Rex.